Apparently being Limitless is still pretty limited, if all it means is making money on the stock market and banging chicks. Then again, we can see an upside to it. Meanwhile Dan explains the strange chemical reactions triggered by saliva, Stuart explains the myriad ways one can deal with a Russian mobster, and Elliott cuts Dan to the quick, office-wise. 0:35 – 2:23 – Elliott’s public airing of grievances. 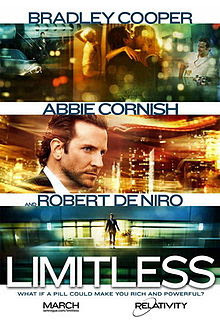 2:24 – 39:26 – We find a surprising amount to say about the wish-fulfillment fantasy, Limitless. 39:27 – 41:30 – Final judgments. 59:14 – 1:00:21 – Goodbyes, theme, and outtakes. The agents provocateur attempting to create a PODCAST WAR are in the employ of the ARMAMENT MANUFACTORIES. Shame! Their greed claims the blood of the innocent! Let a thousand podcast flowers bloom. And The Flop House smells the sweetest, like Coors and cat litter. Wait. This movie could’ve made a pretty cool 80s sitcom. “KNID OF LIKED” = nooooooooooooooooooooo! Embrace the Dark Side of teh Flop House! This is the first time I’ve liked the movie better than the podcast about it. I still love you though.